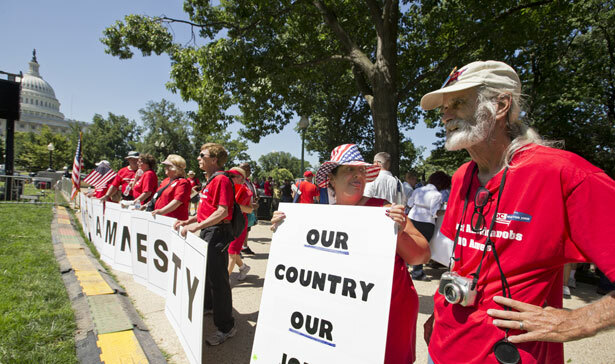 Why can’t reporters be clear about nativist opposition to immigration reform? If there’s one media failing in the immigration debate, it is that many mainstream reporters hedge around the fact that at least some conservative opposition to the bill is based in cultural and even racial animus towards Hispanics. It’s not the only reason people oppose immigration reform. There are many good reasons, and many bad reasons that have nothing to do with race. But a non-trivial portion of conservative opposition reform is couched in those terms, particularly among the activist crowd organizing against the bill. It’s ugly, but it happens to be true. One could forgive mainstream reporters for largely dancing around this fact—if these activists didn’t regularly plan large rallies in the shadow of the Capitol building, and then say a bunch of plainly racist and nativist things into a microphone. Not only was this said in the presence of hundreds of people on Capitol Hill, but many important Republican politicians were present. Senator Jeff Sessions, who helped lead the opposition to the immigration bill in the Senate, was directly behind me, glad-handing attendees, as I shot this video. Congressman Steve King, who is taking up Session’s mantle in the House, was also there. Both men spoke (Sessions is the keynote), and Senator Ted Cruz is also on the roster. The rally was promoted by major conservative media figures like Laura Ingraham. In other words, the rally and its place on the political landscape is impossible to ignore. Last month, another hard-right rally featured Representative Michele Bachmann holding up a white baby and talking about the “future of America”—not quite as explicit, but mainly a difference in degree. There’s no reason for reporters not to clearly explain what these speakers were saying, and be honest about why they oppose immigration reform. This is what happens when you infiltrate an immigration detention center.